Road to Europe Regional. What to see in Berlin? What a surprise we took in PicSil this morning when we saw Sam Briggs using the Azor Grips in the Open CrossFit Games 18.1 announcement. We cann’t be more proud of his performance and of the final result of the first EVENT of the world qualifiers to be the fittest on Earth. What is the 18.1 event? If you are a crossfit fan, you didn’t slept tonight to see live the announcement of the event that you will have to do in the next 4 days. Live from Sao Paulo, Brazil, Dave Castro revealed at last the WOD that had us on fire and very intrigued since the post in his Instagram of the mysterious photo of a statue of a saint. Take little breaths during repetitions and quick transitions between exercises. Use the row for breath and relax the forearms trying to use your legs, even if you go slow, the calories still counting. Keep a good grip on the T2B and try not to lose the pace, even if you do them one at a time. As you could see in the live match between Sam Briggs and the Norwegian Kristin Holte, keeping the pace is the key to adding more reps</ strong>. Is it a question of age ? of experience? of knowing your body and your skills? Everyone has their own strategy. Adapt to the pace of the opponent (although Holte led the WOD at the beginning, Briggs reached it in the fifth round). Be carefull with no reps, especially with the dumbbell. El nuevo estándar de este año es que tienes que cambiar la dumbbell de mano a nivel de la cara y no por encima de la cabeza. And be careful with the Hang Clean & Jerk: Briggs had to repeat the movement several times to make a full Clean by taking the dumbbell from the ground. First make a deadlift, and then run the Hang Clean from the stand position. For his part, Holte has achieved 379 reps and about 13 rounds. Have you noticed the green grips that Briggs used in the first event of the Open CrossFit Games 2018? Indeed, they are our unmistakable Azor Grips. And as we said at the beginning, we couldn’t be more proud to see them in action, in the hands of a great athlete and in a Live Announcement. And we are not at all behind it. 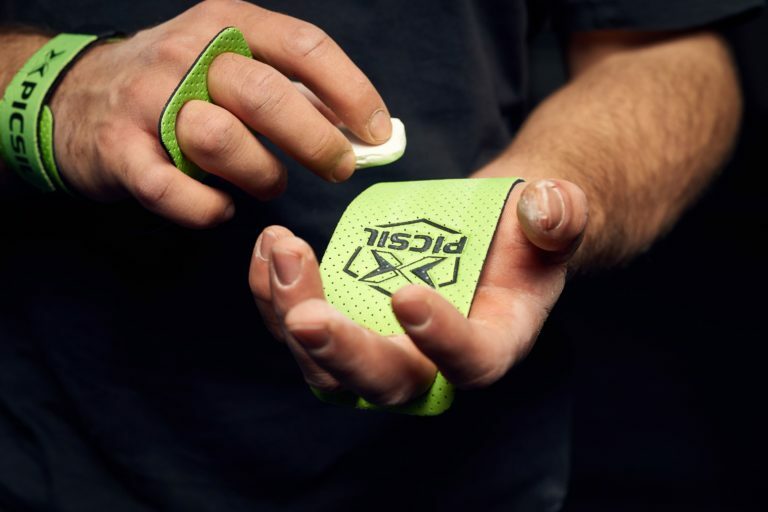 Be these, or any other grips that we have in PicSil, they will be very useful to face the toes-to-bar. They will help you keep your grip on the rack, to link the reps without your hands slipping by sweat and protect your hands from injury. Also, the grips are a good ally for the dumbbell and rowing to not lose grip and, above all, not waste time in throwing magnesium in your hands because of sweat. Did you know that Sam Briggs and Kristin Holte already met in an event of the Open CrossFit Games? It was last year, in the 17.1. After the official announcement, the two athletes performed on a Facebook Live from Paris the fearsome WOD of dumbbells and burpees box jump. And who won? Here you’ll find the answer. What will the rest of the WOD of the Open CrossFit Games 2018 bring us? Dave Castro left this clue at the beginning of this year. What will it be? We will see it in the coming weeks. Remember that you have until Tuesday to send your results of 18.1 on the CrossFit Games website. Good luck and welcome to the Open CrossFit Games 2018.